Since Azure Mobile Engagement became generally available a few months ago, we have been working hard to improve the service and build exciting new features for you! In a nutshell, Azure Mobile Engagement is a SaaS-delivered, data-driven user engagement platform that enables real-time fine-grain user segmentation, app user analytics, and contextually-aware smart push notifications and in-app messaging across all connected devices. It closes the loop for developers, app owners and LoB decision makers to get directly in touch with app users in a personal, contextually-aware and non-intrusive way. We released an updated Windows Universal SDK with support for Windows 10 Universal Apps. We previously supported Windows 8/8.1 apps running on Windows 10, but now you can also integrate Azure Mobile Engagement in a new Windows 10 Universal App. Feel free to fire away Visual Studio to create fantastic Universal Apps which can run on phones, tablets and eventually XBOX – all benefitting from powerful targeted and personalized notification capabilities to build user engagement! Look here for the Windows 10 instructions to integrate Azure Mobile Engagement. We are excited to announce that we now have a Power BI Content Pack. 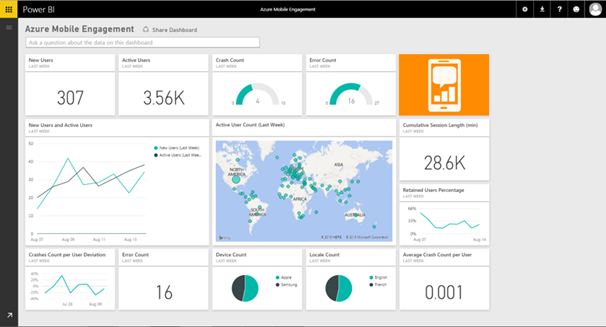 The Power BI team has a great article that walks through the quick steps to connect your Power BI dashboard to your Mobile Engagement backend to produce beautiful and useful charts and visuals like the one below. 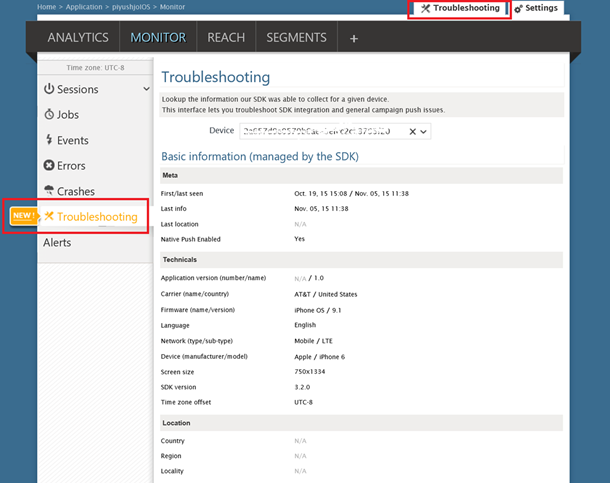 Take a look at this Troubleshooting article about how to find the root cause of common issues such as, why a push notification does not reach the device. You might have seen this communication, but to recap, in the new GA version of our SDKs, we have optimized our communication protocol. As a consequence of this, we plan to deprecate the pre-GA, preview SDK versions from Feb 1st, 2016. Windows SDKs are not impacted by this change. Publish the updated mobile apps to the store so your app users are able to download and update the mobile apps on their devices, well ahead of February 1, 2016. We’d like to hear from you! Please don’t hesitate to connect with us.